Jaw crusher has the advantages of simple structure, low price, simple operation, sturdy and durable, easy maintenance, etc. It has become a common mechanical equipment for the crushing and processing of ore production and processing line, whether it is limestone, granite or dolomite, diabase and other ores. Broken, all need to use jaw crusher equipment. With the development of the times, there are more and more types of ore crushing and processing machinery such as jaw crushers. What are the types of jaw crushers? Shanghai Zhuoya Mining Machinery, as a manufacturer of ore processing machinery and equipment, Zhuoya simple and everyone introduced. The compound pendulum jaw crusher is a commonly used model in the jaw crusher. The largest output of the compound pendulum jaw crusher in China is PE250×400 type; the second is PE400×600 type, PE150×250 type, jaw crushing. What is the model specification of the machine, and what are the main expressions of the jaw crusher? Zhuoya is simple and everyone talks about it. 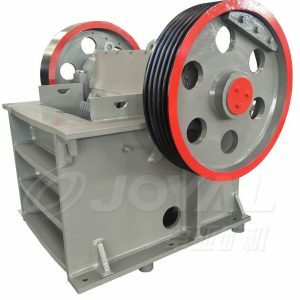 At present, the model specifications of the jaw crusher are mainly expressed in the following ways, such as PEX150×750: P——crusher, E——Jaw, X——fine (grinding is not marked), 150——feeding port Width (mm), 750 – length of feed port (mm); PJ900 × 1200: P – crusher, J – simple pendulum (Jaw), 900 – feed port width (mm), 1200 – Feed port length (mm). Another way of representation is PEFX0207: P – crusher, E – Jaw, F – complex pendulum, X – fine crush (coarse not marked), 02 – feed opening width 250mm, 07 – give The length of the material port is 750mm; PEJ0609: P——crusher, E——Jaw type, J——simplified pendulum, 06——feeding port width 600mm, 09 feeding port length 900mm. Previous: Which materials can be selected for the jaw plate of the jaw crusher?